I still think it’s one of the best tv drama series ever, The West Wing . This wonderful series about a fictional US president and his White House is one of the few series I keep watching over and over again. Besides the superb acting and the solid storylines, the character of president Josiah Bartlett is one of the main reasons. They have made him into a complex, intelligent, strong man who has his faults and shortcomings, but still radiates greatness. The amount of useless knowledge president Bartlett has is impressive (for instance on National parks…or that a strawberry is the only fruit with its seeds on the outside), but he also knows his stuff when it comes to important matters. In the series, he is never without a book and he is constantly feeding himself with knowledge and wisdom of others. Leaders are learners! What are you reading right now that will make you grow as a leader? 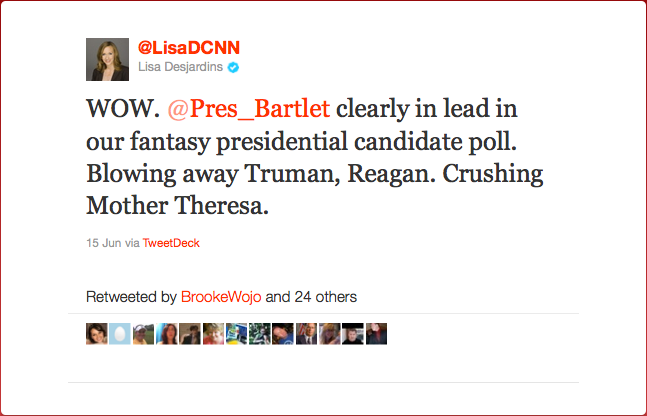 President Bartlett would be nothing without his trusted team of advisors and he picked his people well. They are without exception talented, passionate and willing to work hard. However, they have little or no experience for the most part. As a leader, you are nothing without a great team around you. Make sure you pick people for the right reasons…and experience may not always be one of the key factors. Bartlett’s advisors show they know the meaning of the word ‘serve’ time and again. They serve at the pleasure of the president, and that includes doing things they don’t like, they don’t want or they don’t agree with. But they do them anyway, because they serve at the pleasure of the president. They give their opinion, they try to persuade the president, but when he’s given an order, they serve. When we serve under a senior leader, we need to do the same. We honor God by serving those above us. Bartlett needed time to be Bartlett. At the beginning of season two there are a few flashback episodes that show Bartlett struggling in the primaries. He’s trying to find his voice, his style. He’s trying to find himself. When he does, he starts to shine. Later this repeats itself when well intended staffers try to tell him to be different than he really is, less of a know-it-all, more down to earth. But in the end, the decision is this: Let Bartlett be Bartlett. As a leader, find your own style and stick to it. God has purposefully made you like you are and He can use you just as you are. It’s good to grow as a leader, but stay true to who you are. 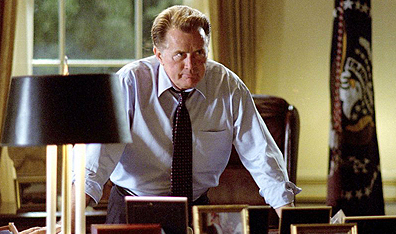 The West Wing shows how many difficult decisions end up on the President’s plate every single day. Bartlett does a wonderful job however of making decisions. He gathers information, is not afraid to hear opposing opinions from his staff (as a matter of fact, he sometimes specifically asks for them! ), always asks for the input of his right hand Leo, debates and discusses…and then decides. That doesn’t mean he always makes the right decisions, but it does mean he’s not afraid to make decisions. Being a leader means having the guts to make decisions, even the tough ones. As the ‘real’ president Truman famously had on a sign on his desk in the Oval Office: the buck stops here. If you’re the leader, you’re it. You have to make a decision. So do it. Gather info, hear as many voices as you need, pray about it and then decide. And then, say as Bartlett would say: ‘What’s next?’.